Demonstrators picket outside the proposed future site of The Vatican Downtown Community Center. VATICAN CITY—Citing its historical significance and the valuable role it plays in the community, residents of Vatican City rallied this week to save St. Peter’s Basilica from being demolished as part of a development project that would convert the site into an expansive residential and retail complex, sources reported. Plans to replace the Renaissance-era church with The Vatican Downtown Community Center—informally known as “The Communion”—were reportedly first revealed by representatives of the Miami-based real estate firm RJ Lerneman & Co. during a city council meeting last Friday. The presentation, which touted the luxury apartments and high-end storefronts of the six-acre mixed-use development, was said to have immediately divided those in attendance, sparking an hour of intense back-and-forth debate and ultimately launching the campaign to save the Baroque-style church and Catholic pilgrimage site from destruction. “Do we really want the Vatican to be just like every other city in Italy?” she continued. The proposed development would bring a Mrs. Fields, Nine West, and Equinox Fitness location to Vatican City residents. According to critics, the proposed design—consisting of several seven-story, steel-and-glass condominium buildings each with ground-floor premium-brand retailers and terrace cafés, as well as a winding promenade featuring numerous green spaces and a bike path—was hastily approved by Vatican City officials without any formal input from the community. Drawing more ire from those opposed to the project, developers recently confirmed that J.Crew, Regal Cinemas, and restaurant chain Johnny Rockets have already committed to leasing space in the complex that is to be erected on the plot of land where St. Peter was said to be crucified during the reign of Roman emperor Nero. 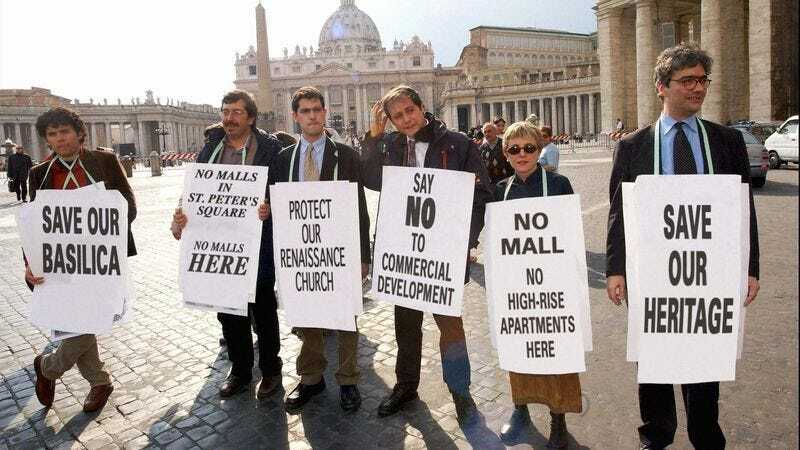 In addition to draping a large “Save Our Basilica” banner over the church’s travertine facade, opponents of the development have reportedly organized a petition drive and letter-writing campaign to voice their objections to The Communion, reportedly sending city leaders over 3,000 pieces of mail pleading with them to reconsider destroying the church commissioned by Pope Julius II and designed in part by Raphael. Those protesting the proposed downtown center were also quick to dismiss the developers’ plans to preserve Michelangelo’s Pietà by placing it near the entrance of the property’s Nike Town athletics store, arguing that the effort was merely a token gesture designed to appease those who wished to save the 500-year-old holy site and tomb of one of Christ’s apostles. During a recent “Save St. Peter’s!” charity auction held to raise funds for their preservation efforts, several organizers expressed their disappointment with the majority of cardinals who have declared support for the project, saying they should understand more than anyone the importance of protecting a church many residents have attended since they were children and that houses the remains of over 90 popes. When asked for comment, Vatican officials stated that while the crown jewel of Western Christendom will be missed, the development project will finally create a centralized community space for residents and also provide a boost to the ecclesiastical state’s economy. “If people want to go to church, they can always head to St. John Lateran right up the road,” he added. At press time, a work crew was seen tossing sections of pews and various reliquaries into a large roll-off waste container parked on St. Peter’s Square.